Text by William Stafford, image is woodcut on Zerkall Niddegen paper, 12 x 15 inches. 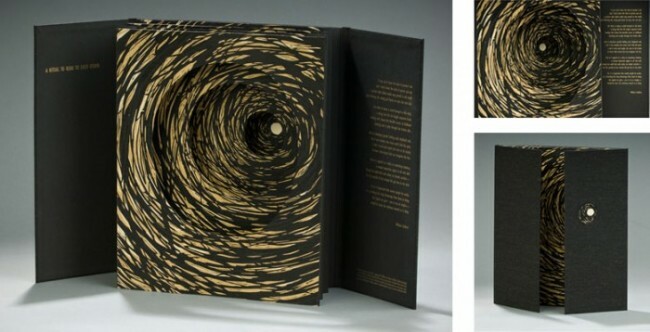 The structure is a tunnel book. Date of Publication, 2007, printed and bound by Susan Lowdermilk as a limited edition of 25. Text set in Gill Sans Condensed, printed from polymer plates and dusted with powdered pigment at lone goose press, Eugene, Oregon, “A Ritual to Read to Each Other” poem copyright © 1998 by the Estate of William Stafford. Reprinted from The Way It Is: New & Selected Poems with the permission of Greywolf Press, Saint Paul, Minnesota. A Ritual to Read to Each Other was created in reaction against the US/Iraq and Afghanistan war. The two-dimensional woodcut image that makes up the tunnel structure was originally titled, “Peace Inside the Noise” and was meant to stand on it own. As a tunnel book, I feel the piece visually and conceptually supports Stafford’s message in his poem, “A Ritual to Read to Each Other”—A plea for reliance on community and cooperation for peace and harmony. Copyright © 2018 Susan Lowdermilk, All Rights Reserved.